April 3, 2009 | As the snow begins to melt and the school year begins to wind down, there is a noticeably different air up on the third floor of the Taggart Student Center. The third floor of the TSC has long been the home to the Associated Students of Utah State University, USU’s student government. With the elections of new officers three weeks ago and their upcoming inauguration just two weeks away, the old council is preparing to move on, pack up and move out. 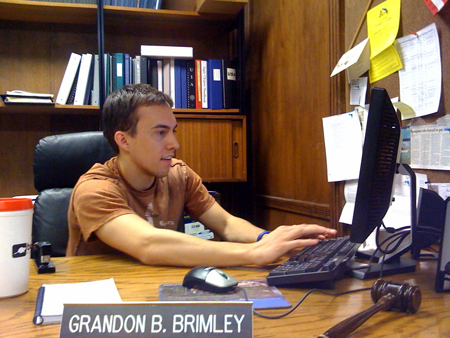 Perhaps no one is more aware of this than Grady Brimley, this year’s student body president. Brimley, the unlikely candidate for president who last year made a come from behind victory over two other favored candidates, can hardly believe that his year at the helm of ASUSU is virtually at an end. Fast as it was, Brimley agreed to sit down with the Hard News Café prior to his exodus and tell us more about his year, his experience and his hopes for the future. HNC: Do you feel like this year was a success? GB: Yes, because the one thing I wanted to use to measure my success by at the end of the year was having more people wanting to be involved in ASUSU, and the amount of people who ran for ASUSU offices this year showed that. Also, my goals were accomplished. We had more accessibility between officers and student body, bigger turnouts to events, we’ll have an internship director next year and we’ll also have free parking in the terrace next year after 6:00 p.m. on weekdays. HNC: What was something that you wanted to accomplish that you didn’t? GB: I was hoping that the web site would be a bigger success, and that more students would have used it to learn about what was going on around campus. We had some problems with the web site and it never really caught on this year. I’ve asked my successor to take it on, and hopefully he will. HNC: If you could go back and do the year all over again, what would you do differently? GB: I would have played more pingpong. I mean, I like being busy, and being involved in a lot of things, so for me that’s fun. But I probably could have made more time to just relax and play a little pingpong. HNC: Do you think the Athletic Fee increase will be a black eye on your presidencyl? GB: No I don’t, because for one, I didn’t make the decision ­ the students did. As a council, we decided to turn it over to the students because it was such a big fee being requested. Ten years from now, I think that most people will be happy that the fee was raised and that we have a quality athletic program. HNC: What words of advice did you give your successor? GB: To fight to keep the student activity fee the same and to not ask for an increase. It’s easy to find reasons to ask for an increase, but it’s also totally possible to work things out so that the students don’t have to pay more. HNC: How do you hope to be remembered? GB: Taller than I am. Good leaders are always known to be tall and I’m really short. Also, that I wasn’t cliquey and that I didn’t buy in to an “elitist ASUSU” mentality. That I thought like a regular student thinks and that I approached problems like a regular student would approach a problem.